The beads plating method is used to vacuum evaporation of metals. In high vacuum on a glass beads applied very thin layer of metal powder. 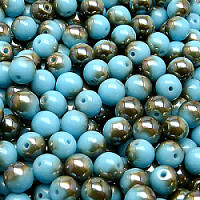 The deposited metal layer precisely copies the surface of the beads. Metallization is achieved by creating a reflective layer or a decorative metal appearance. The most commonly used material for vacuum coating is aluminum (Al). This technology can be applied even more pure metals such as copper, nickel, chromium, silver, gold, and others.